Gun and ammunition retailers have seen a spike in sales following the terrorist attacks in Paris and San Bernardino, California. Though gun sales had already set records for seven consecutive months, several national retailers saw their sales triple in the two weeks since the attack in California. The spike in sales nationwide closely mirrors a spike gun and ammunition dealers in and around San Bernardino have seen. Online ammunition dealers Lucky Gunner and Ammunition Depot have seen a surge in sales they believe is a direct consequence of the attacks. "We've seen a dramatic spike in business," Scott Blick, a managing partner at Ammunition Depot, told the Washington Free Beacon. "I would say about 300 percent. We really haven't had time to breathe too much just because we're so backed up." "We’ve actually seen an increase in sales since the attacks in Paris, likely due to fears of terrorism at home," Anthony Welsch, Lucky Gunner spokesperson, said. "That, in addition to the Christmas shopping season has a lot of folks buying ammo." Bud's Gun Shop, which operates one of the nation's largest online gun stores, as well as a brick and mortar shop in Kentucky, has seen the same jump. "We have seen an increase in both the sales of certain types of firearms and ammo," Rex McClanahan, Bud's Gun Shop president, said. "Our sales had actually increased substantially just before the attack out in San Bernardino. We actually expect to see a significant increase every year about that time due to the upcoming holidays, Black Friday, Cyber Monday, etc." "The San Bernardino attack just made our already ‘busy season' more like a chaotic mess." The increased interest in guns has also affected firearms training. 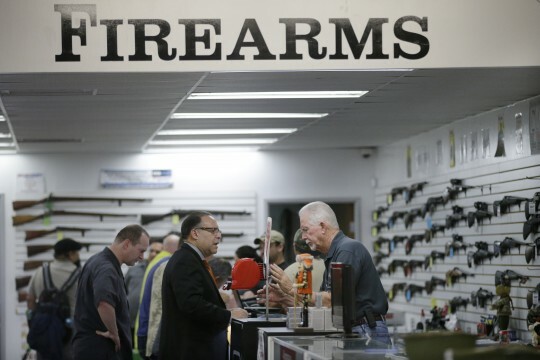 The National Rifle Association Range in Fairfax, Virginia, has noticed a jump in customers. "YES," Michael Johns, general manager of the range, wrote in an email. "We have seen a strong traffic increase based on this event as well as seasonal changes. I would guess increases have been in the neighborhood of 20-30 percent." "We are seeing a lot of questions about CCW classes and interest in firearms for carry and home protection." The National Shooting Sports Foundation, an industry lobbying group, said hard numbers are not available for nationwide sales over the last two weeks but that reports of a sales spike are likely credible. "We have no hard data other than Thanksgiving weekend/Black Friday NICS data," Larry Keane, the foundation's senior vice president, told the Free Beacon. "We will have to wait for the December NICS to come out but we have seen all the media reports and our experience is that whenever anti-gun politicians exploit a tragedy to advance their gun control agenda, as has happened after the terrorist attacks in Paris and San Bernardino, sales of firearms significantly increases." "We have every expectation that this is happening in the market now as the anecdotal news reports suggest." The retailers suggested the bump in sales was driven by new consumers and a desire for protection from future attacks, a different motivation than what drove record sales after the Sandy Hook shooting and President Obama's reelection. "From our emails, from people calling in it seems to be that people are very fearful right now," Ammo Depot's Blick said. "There are actually a lot of new buyers. We've seen a lot of new customers that are purchasing from us. It's our thinking that this is actually more of a sustained bump up this time because people are realizing that the government is not going to protect them. It's up to them to protect themselves and their families." "It's been a dramatic rise in new customers coming to our website." Lucky Gunner's Welsch agreed. "In terms of why the interest in guns and ammo, I can say that we’re hearing a renewed interest in vigilance and personal safety in conversations with our customers through social media as well as over the phone," he said. "California definitely piqued a lot of people’s interest," the NRA's Michael Johns said. The retailers said that popular self-defense guns and calibers have seen the greatest increases in sales. "We have seen a significant spike in [assault rifles], just not as extreme of a spike as with the ammo they use," McClanahan said. "We have also seen a large increase in handguns that would commonly be used by the purchaser for conceal carry purposes… the most popular (by far) of those being the Ruger LCP, which has pretty much dominated that pocket gun market since it came out. " The spike has even led to concerns over being able to keep products in stock. Ammunition Depot is running low on .22, which is popular for target shooting and has been difficult to find for many months, and .223, which is ammunition commonly used in AR-15s and other popular rifles. 9mm, which is one of the most popular handgun rounds, is "heading in that direction" due to increased demand Glick said. "Supply is drying up," he said. With gun sales in 2015 already on pace to set an all time record, the early December spike in sales may push the total beyond what anybody has yet predicted. This entry was posted in Issues and tagged 2nd Amendment, California, Gun Control, Guns, NRA. Bookmark the permalink.